As I gazed at the slab of magenta-pink meat on the rock-like surface, I noticed the extensiveness and even-ness of the cream-coloured interconnected veins, or marbling, as the experts call it. To the discerning eyes, they know exactly what it means: extremely prized meat that almost melts, like butter in the mouth. 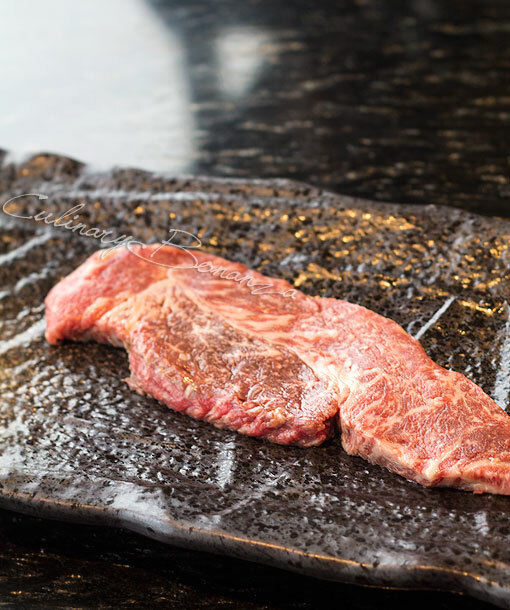 It came as no surprise as to why Ohmi beef is named Japan's top 3 wagyu and why it is a pure splurge on your dining bill and why there are only a few (if not, only one) place(s) in Jakarta, which dare(s) to serve this exquisite meat. 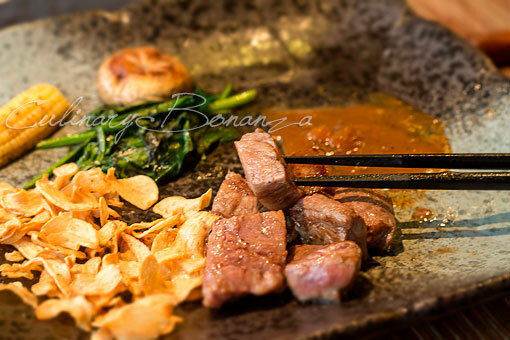 Kahyangan Teppanyaki is one of the place(s), where you can find Ohmi beef here. Which brings us to the next question, "Just how much are you willing to pay for a meal?" The answer will definitely differ for each individuals. To some, a meal is just a means of survival, to others, it's an art, a life enjoyment. The different perception means some are only willing to pay a certain amount for a filling dish while a few others are willing to splurge lavishly for a few hours-long meal consisting numerous small dishes. The great divide eventually boils down to the old adage that guides your beliefs: "Eat to live" or "Live to eat". Way before dining from great heights became much-hyped in Jakarta, one restaurant already laid a cornerstone 40 years ago. Kahyangan Shabu-Shabu Restaurant is a living witness of Jakarta’s rapid development, from a once sleepy capital to the massive jungle of concretes and automobiles today. 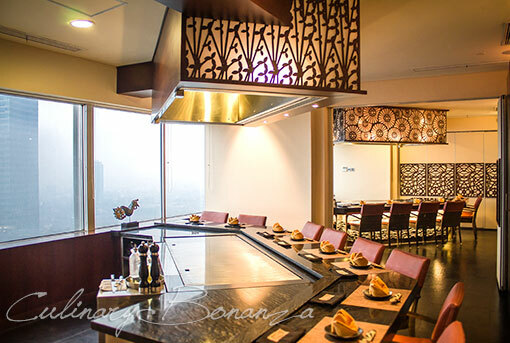 The fine dining restaurant specializes in shabu-shabu and it is located in the once Jakarta’s tallest building. It has stood the test of time and gained respectable nods from the distinguished guests, such as the country’s prominent business figures and the high-ranked government officials, the likes of former Governor and former President of Indonesia. 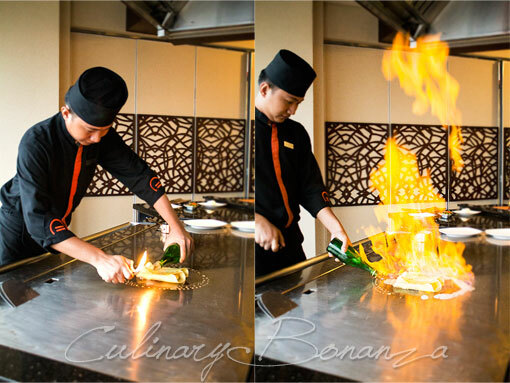 40 years of legend in the making, in April 2012, Kahyangan opened its Teppanyaki-themed restaurant. Still located on the same floor, Kahyangan Teppanyaki can accommodate up to 70 persons and more, with its 6 private rooms that fits 8 – 10 persons. 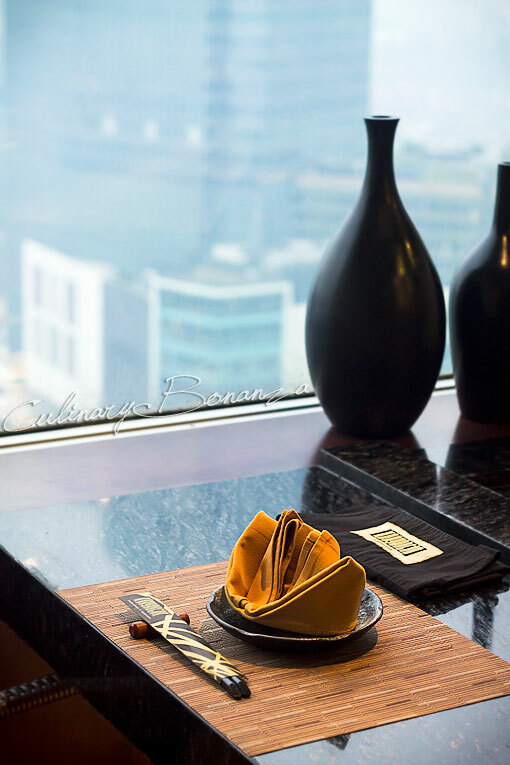 The private rooms are each served by well-trained teppanyaki chefs who cook your food right before your eyes, thus creating an intimate yet interactive dining experience. 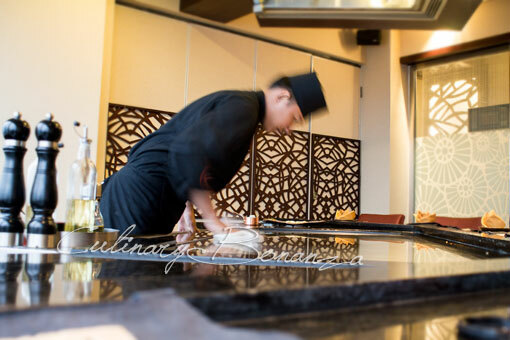 The menu offers a la carte items such as Appetizer, Salad, Soup, Sushi Rolls, Sashimi, Premium Sashimi, Bento Set (Lunch only), Agemono (fried), Yakimono (grilled), Rice & Dessert as well as set menus for Yakiniku and Teppanyaki, with the Teppanyaki Premium Set for 2 persons being the most popular. So the following will show you, what a Teppanyaki Premium Set for 2 persons is like. 1. Zen Sai (2 kinds of small appetizers). 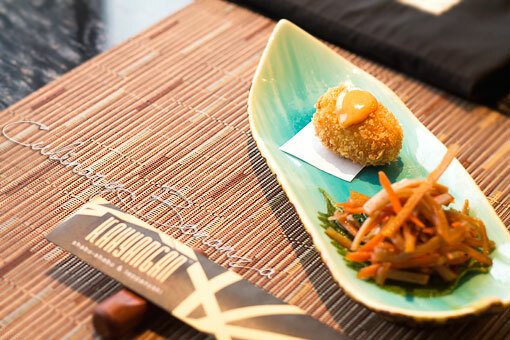 One of the Zen Sai was a crab croquette and the other was some kind of marinated vegetables. 2. Organic Mixed Green Salad with Yuzu Soy Dressing. 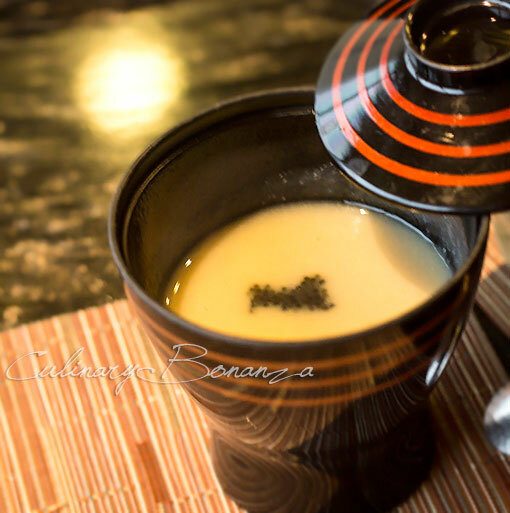 Soup of the day: Cream of Cauliflower topped with black caviar, which balanced the slight tartness of the cauliflower. 4. Choice of Seared Foie Gras with Balsamic Teriyaki Sauce or Seared US Scallops with Kani Sauce. Again, I was surprised to find foie gras in a teppanyaki restaurant and truh be told, was rather skeptical about the taste. 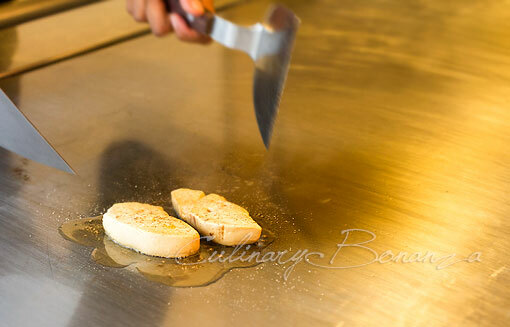 The smell of foie gras searing on the teppan was not exactly appetizing, because being a liver, it has a strong odour. Our chef did a wonderful job with the plating, just look at the picture below. 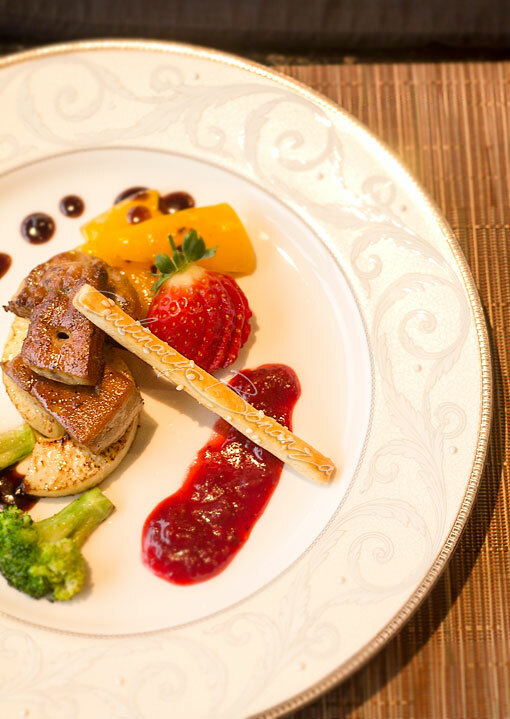 The seared foie gras was served with seared broccoli, pear and bell pepper, accompanied with berry sauce and balsamic teriyaki sauce and cheese stick and strawberry as garnish. The foie gras had somewhat crispy crust and very tender, almost creamy core. It was absolutely exquisite, and I would say, one of the best foie gras dish I've ever had so far! 5. 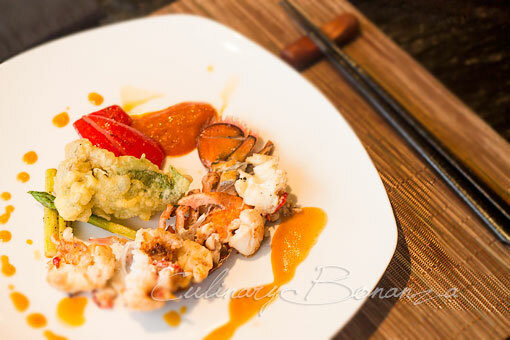 Live Canadian Lobster (400-500gr/pcs) with Sea Urchin Sauce. 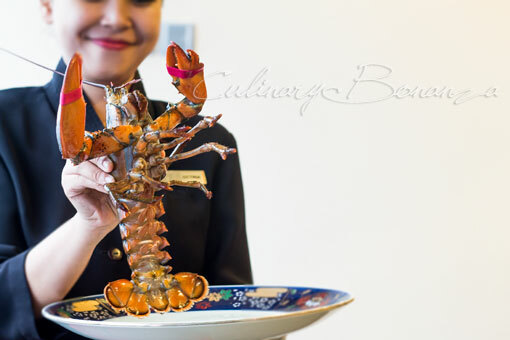 When the lady held the live Canadian lobster up from the plate, it was still very much alive and writhing. But just a short moment later, the crustacean was already cut lengthwise and ready to hit the sizzling teppan. Since I've never had any real lobster-based dish, I didn't quite know what to expect. As it turned out, keeping the lobster alive right until before it was cooked, was a method to ensure its freshness and richness of the flesh. The lobster in fact tasted somewhat sweet, which was balanced by tanginess and tartness from the orange-coloured uni (sea urchin) sauce. 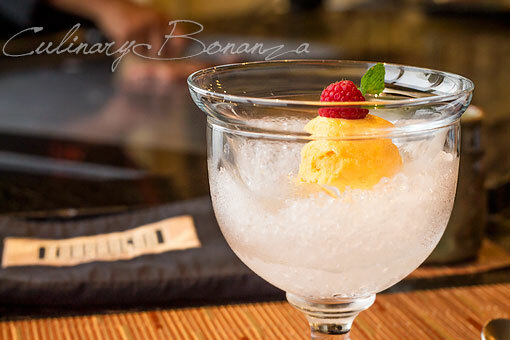 Palate Cleanser: Orange Sorbet. Apparently, palate cleanser is also common in Japanese dining and not just French. The price says it all, and the picture tells all. My chopsticks punctured through the steak dice effortlessly. The medium-cooked steak tasted unbelievably tender. I could never stomach cheap steak anymore after this (bad news for my wallet!). It was juicy on its own, but to add more flavours, you can eat it with a little bit of salt and/or the brown stock sauce. 7. Choice of Fried Rice with Anchovies or Inaniwa Noodles. Japanese-style fried rice, with generous amount of Indonesian-Japanized anchovies, meaning: the anchovies are from Indonesian seas, but packaged in Japan and then sold back to the local market. The yakimeshi was delicious, but with what little room left in my tummy and my low tolerance for chili (I signed up for extra chili padi), I couldn't manage more than a few spoonfuls. A lobster is too precious to waste. After the flesh was grilled (earlier), only its head and other parts are left. These too, were not spared and were boiled to make lobster miso soup. 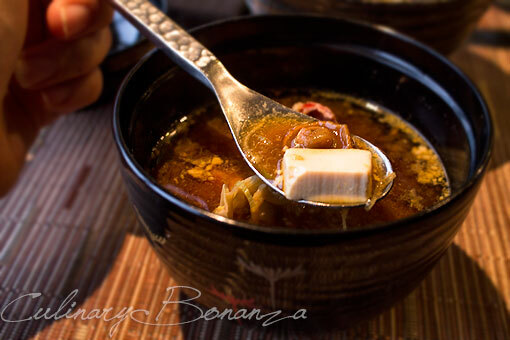 The soup is not the usual pale-coloured miso, but it looks brownish and more murky with some bits of the lobster meat visibly floating. 9. Banana Flambée (seared banana, vanilla ice cream & Crêpe). 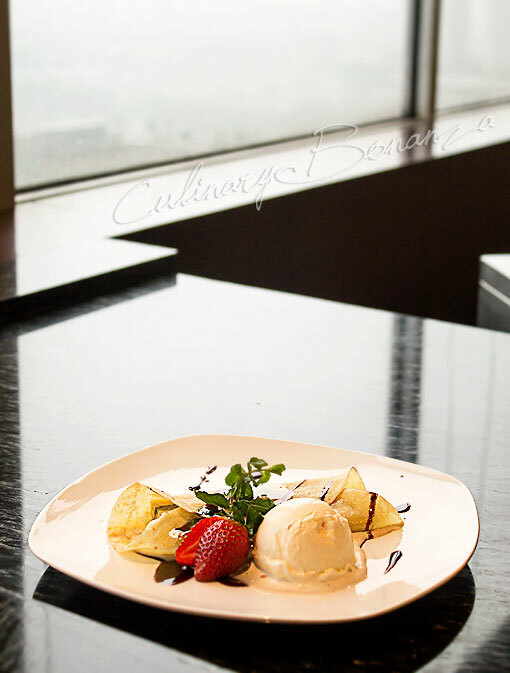 The Banana Flambee was a perfect ending to the long and lavish lunch. I truly enjoyed the show, though I had to see it from behind my lens as I tried to capture the moments, as you can see below. Careful there, don't singe your eyebrows, Chef! 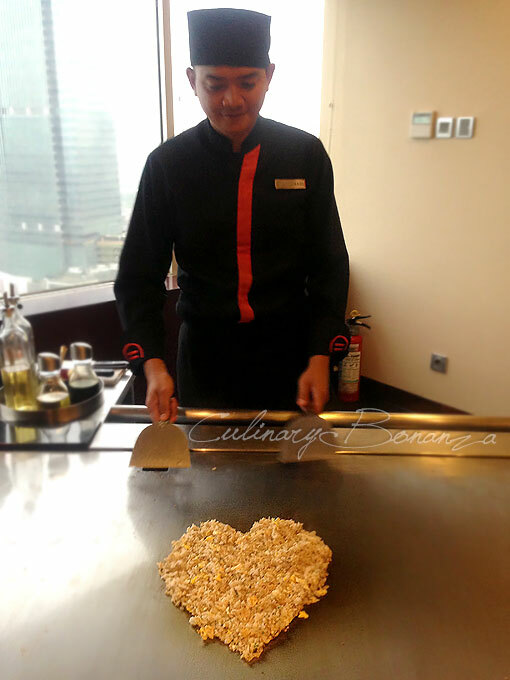 Kahyangan Teppanyaki is a perfect place to impress your guests or business relations over magnificent food, entertaining cooking spectacle, great view of Jakarta’s throbbing heart 28 floors above ground and strategic location. So, what's your philosophy, "Eat to live" or "Live to eat"? NICE SHOTS! Loving all of it, especially the one with the fire!